Now this is the announcement Verizon should have made today in NYC. Anyone in need of a free Network Extender? I may not be, but I know that many of you are and it’s looking like VZW is sending them out to people in low-coverage areas. 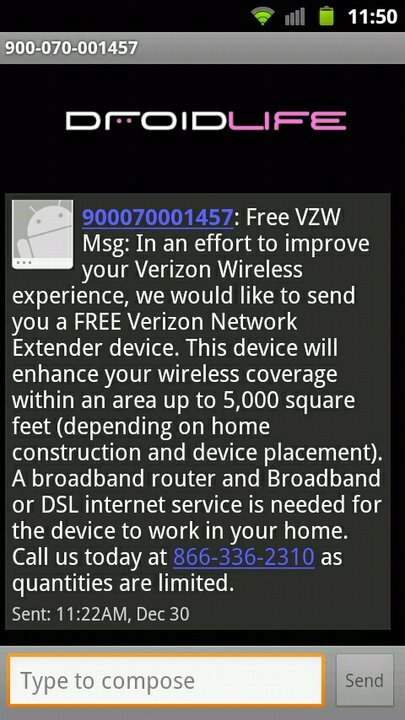 A few of our readers received this text over the the last week and according to one of them who responded, an extender is already on the way. Now, I would never ask that you bombard the phone number listed above, but hey, might be worth it if your house, apartment or cardboard box struggles to catch a signal. Update: We’re hearing reports that you should only have been able to receive this promo if the text was sent to your phone. We’re also hearing that the number has been disconnected and that users are waiting on line for up to an hour to be turned away. Like we said, don’t bombard it! Tuesday Poll: So, Who's Switching to it?